German pathologist; born at Demmin, Pomerania, July 20, 1839; died in Leipsic Aug. 15, 1884. He studied at the universities of Würzburg, Marburg, Greifswald, and Berlin, receiving his doctor's degree at Berlin in 1861. After taking a postgraduate course in Prague, he returned to Berlin in 1862, where he practised until 1864, when he took service as surgeon in the war against Denmark. In the fall of the same year he became assistant at the pathological institute of Berlin University under Virchow, remaining there until 1868. During this time he published several articles relating to physiological chemistry and histology, but finally turned his especial attention to pathological anatomy. In 1867 there appeared in Virchow's "Archiv für Pathologische Anatomie und Physiologie und für Klinische Medizin" (xli.) Cohnheim's essay, "Ueber Entzündung und Eiterung," which made his reputation as a pathologist. In it he proved that the emigration of the white blood-corpuscles is the origin of pus, a statement which produced a great revolution in pathology. 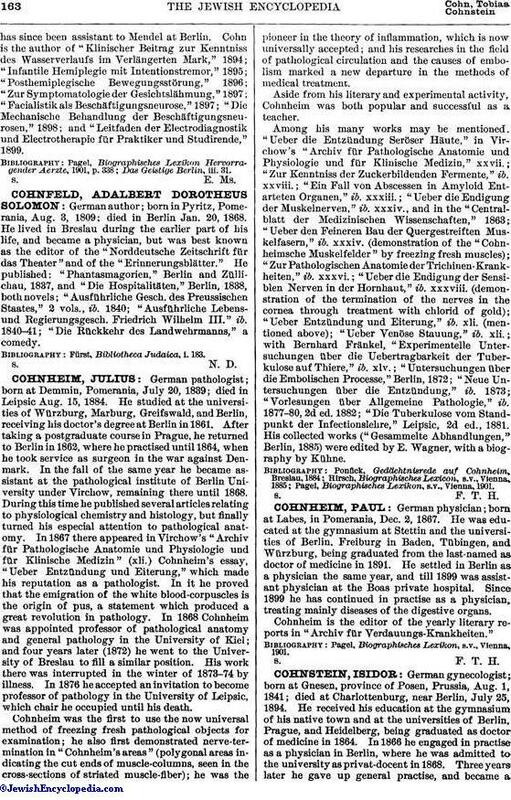 In 1868 Cohnheim was appointed professor of pathological anatomy and general pathology in the University of Kiel; and four years later (1872) he went to the University of Breslau to fill a similar position. His work there was interrupted in the winter of 1873-74 by illness. In 1876 he accepted an invitation to become professor of pathology in the University of Leipsic, which chair he occupied until his death. Cohnheim was the first to use the now universal method of freezing fresh pathological objects for examination; he also first demonstrated nerve-termination in "Cohnheim's areas" (polygonal areas indicating the cut ends of muscle-columns, seen in the cross-sections of striated muscle-fiber); he was the pioneer in the theory of inflammation, which is now universally accepted; and his researches in the field of pathological circulation and the causes of embolism marked a new departure in the methods of medical treatment. Aside from his literary and experimental activity, Cohnheim was both popular and successful as a teacher. Among his many works may be mentioned. "Ueber die Entzündung Seröser Häute," in Virchow's "Archiv für Pathologische Anatomie und Physiologie und für Klinische Medizin," xxvii. ; "Zur Kenntniss der Zuckerbildenden Fermente," ib. xxviii. ; "Ein Fall von Abscessen in Amyloid Entarteten Organen," ib. xxxiii. ; "Ueber die Endigung der Muskelnerven," ib. xxxiv., and in the "Centralblatt der Medizinischen Wissenschaften," 1863; "Ueber den Feineren Bau der Quergestreiften Muskelfasern," ib. xxxiv. (demonstration of the "Cohnheimsche Muskelfelder" by freezing fresh muscles); "Zur Pathologischen Anatomic der Trichinen-Krankheiten," ib. xxxvi. ; "Ueber die Endigung der Sensiblen Nerven in der Hornhaut," ib. xxxviii. (demonstration of the termination of the nerves in the cornea through treatment with chlorid of gold); "Ueber Entzündung und Eiterung," ib. xli. (mentioned above); "Ueber Venöse Stauung," ib. xli. ; with Bernhard Fränkel, "Experimentelle Untersuchungen über die Uebertragbarkeit der Tuberkulose auf Thiere," ib. xlv. ; "Untersuchungen über die Embolischen Processe," Berlin, 1872; "Neue Untersuchungen über die Entzündung," ib. 1873; "Vorlesungen über Allgemeine Pathologie," ib. 1877-80, 2d ed. 1882; "Die Tuberkulose vom Standpunkt der Infectionslehre," Leipsic, 2d ed., 1881. His collected works ("Gesammelte Abhandlungen," Berlin, 1885) were edited by E. Wagner, with a biography by Kühne.